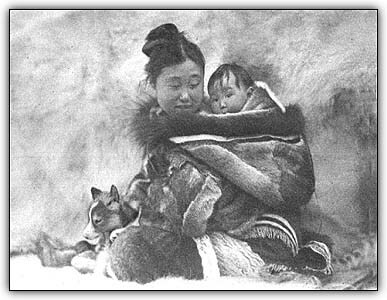 This post is based on a screening of Nanook of the North, with live accompaniment, held at the Toronto International Film Festival (TIFF) Bell Lightbox on June 21, 2012. Time keeps moving and with it, the boundary lines for acceptable artistic expression. Take, for example, Nanook of the North: an influential, successful documentary that would not be made today. At least, not the way it was made in 1922. We are a modern audience. When we read a title card in Nanook describing the Eskimo as “happy-go-lucky”, we’re suspicious. The description is precious nonsense, applying a personality trait to an entire culture. 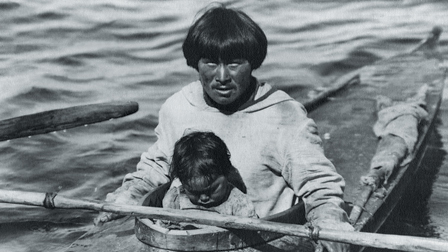 Did the Inuit of the 1920s tend to be upbeat? I don’t know. But I bet they had their bad days up there in the Arctic too. 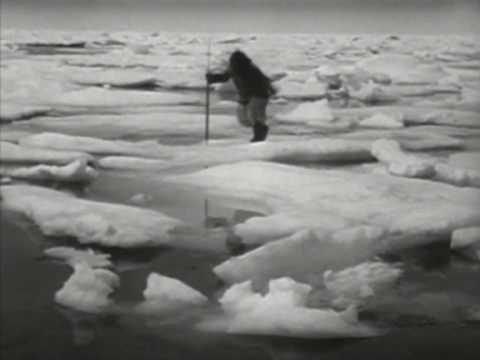 Once, a talented filmmaker like Robert Flaherty, a white man with an education and a love of far away places, would have been considered the ideal person to record and transmit the particulars of a culture like the Inuit’s to his fellow whites. Today, the first thing we notice is that he’s doing all the talking. The film’s title cards only describe events; and those descriptions are Flaherty’s. As in almost all silent films, we see people saying much more than we end up reading, but in this film, apparently, neither the main character, famed hunter Nanook, nor his two wives, nor his fellow hunters, nor even his children, uttered a single word deemed worthy of transcription. Who are these people, exactly? The film tells us they are a family. Nanook of the North is presented as a documentary of the family’s life; covering, it seems, less than a year. 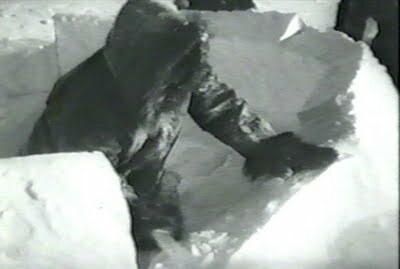 Flaherty’s camera follows Nanook on walrus and seal hunts and to a trading post; records a wife bathing his son; shows us the building of an igloo. All of this is held together not so much by a narrative as by themes: the first being scarcity and hunger, and the second, novelty. The first preoccupies the Inuit in the film, and the second, back then and even today, preoccupies the audience. See, Nanook is really interesting to watch. I first saw it five years ago, on DVD, and the scene I remember best was the building of that igloo. I told all my friends about how it was done. It’s not just blocks of snow in a mound, you realize: the Inuit actually made igloos with windows in them. How? By carving a hole in the igloo’s wall, then carving a thin block of ice to fit it. Once the ice was in place—and this was the neatest part—the builder affixed another block of snow to the outside of the igloo, perpendicular to the ice window, to redirect light from the sun down upon the ice, and inside. Everything used to make that igloo was drawn from the arctic land, with hands and knives. Nanook of the North is a testament to human perseverance in the face of want. 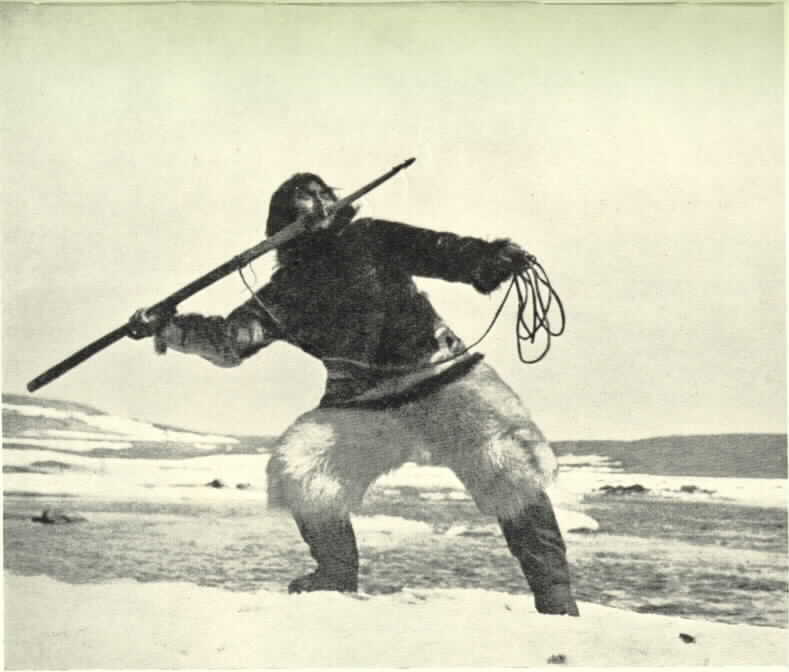 It is summed up best by the last hunting scene, when we see Nanook standing in a bleak field of white, holding on mightily to a thin cord connected to something beneath the ice. Then he pulls up and through the ice a massive seal. It’s as though this selfish terrain has given up a treasure. Slick, black and bulbous, erupting from the ground, the seal even reminded me a bit of a bubble of oil. But again, we’re suspicious of all this. 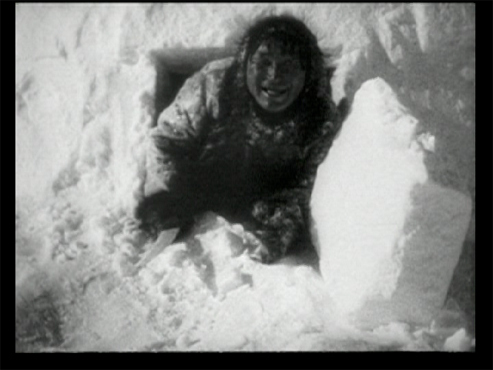 Now, 90 years later, it takes us only seconds to learn that Nanook’s real name was not Nanook, but Allariallak; that the women portraying his wives were not his wives (though they may have been sleeping with Flaherty); that the interior shots of the igloo were filmed in a different igloo. Worse, the Inuit in the film are anachronistic. They’re depicted hunting with harpoons and knives, though by the time the film was made, they were already using guns. The walrus hunt we saw was, apparently, already an obsolete practice in 1922. 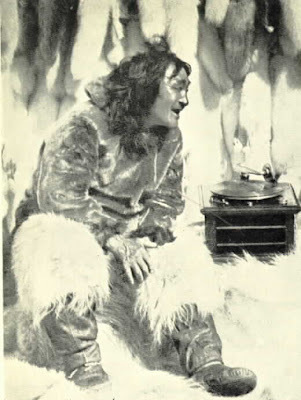 The famous scene of Nanook at the trading post, perplexed by the workings of a gramophone, is inaccurate; as the Inuit were by then quite familiar with recorded sound. Something else they were familiar with: cameras. At least, the Inuit crew Flaherty employed was. This fact adds a fascinating layer to the film. It makes modern audiences, whatever their own backgrounds, wonder—as they should—what was going through the minds of that crew as they helped to “document” the practices of their society as it existed more than a generation before. Perhaps it offended them. But I don’t think it’s politically incorrect to think they had fun with it, too. All this matters, because no groups have been more historically marginalized by film, or more misrepresented in it, than indigenous peoples. Nanook’s impact today is as much due to the questions it raises as any entertainment value it still has—like why a false situation could so blithely be represented as true; and why no one presumed that a white, southern audience would be as interested in real Inuit life in 1922 as they would be in this live-action diorama. And why no one saw the need to show them the difference. Which brings me back to where and why I saw Nanook tonight. Nanook of the North was the opening selection of First Peoples Cinema: 1500 Nations, One Tradition, a programme of films by and about indigenous peoples, curated by Toronto critic and programmer, Jesse Wente. Though Nanook is by no means the most offensive silent film Wente could have chosen (see for example, Sitting Bull and the Spirit Lake Massacre), its combination of renown, commercial success and muddled reality made it the right film to present, and critique, this night. The programme went further, though: seeking not only to place Nanook in its proper context, but to reclaim it on behalf of the group it misrepresents. From an educational standpoint, this was a success. From a purely artistic one, I’m not so sure. As Wente later explained, the print of Nanook we saw tonight had been restored several times before. However, this one was the first, as far as I know, to have been subtitled into Inuktitut. Meaning, at the bottom of every one of the film’s title cards was another set of sentences, written in Inuktitut script, saying the same. I suspect few people in that audience, aboriginal or otherwise, could have read that script more easily than the English above it, but no matter. My issue with the writing was the distraction it caused. The letters: bright, glowing white, seemed to impose themselves on the print. Worse, the title cards in Nanook are typically wordy, and several times the Inuktitut script obscured some of the English. You could read everything if you waited, but I read quickly, and so found it frustrating. The live accompaniment for the show, headlined by Inuk throat-singer, Tanya Tagaq, presented a problem too. Tagaq is a talented vocalist. Her art form is a combination of singing and sound-effect making—one that grew out of the scarcity of materials with which to make instruments in the far north. Most sounds Inuit musicians wished to make had to be made with the voice, and so they became quite versatile at doing so. Tagaq accompanied Nanook not only with singing, but with sounds of heavy breathing, crunching snow, sled dogs howling and babies crying—sounds an Inuk hunter like Allariallak might well have heard ringing in his ears during a taxing hunt. It was an impressive, and surely exhausting, performance. However, Tagaq wasn’t alone onstage. She was accompanied by both a violinist and a percussionist, and in a sense, herself: throat-singing is usually performed by pairs of singers and Tagaq, in order to perform alone at this event, sung in a sort of duet with her own, pre-recorded voice. Everyone was great. But it’s not enough to be great when accompanying a silent film—one must also defer to the images onscreen, supporting them, rather than supplanting them. The accompanists for Nanook created a soundscape so busy that the film couldn’t breathe. Flaherty’s memorable vistas, which might have benefitted from subdued sound, or perhaps none, weren’t given the chance to impress on their own. Believe me, they can. Nanook of the North was screened live at Toronto’s TIFF Bell Lightbox on June 21, 2012. Live accompaniment was provided by Inuk throat-singer, Tanya Tagaq. The screening is part of First Peoples Cinema: 1500 Nations, One Tradition. Nanook of the North is also available on DVD through Criterion.